Our March Athlete of the Month is none other than Anna Delevoe aka Delevoe (well, thats what I call her). Anna has been part of the 954 family just shy of a year. When Anna joined CrossFit 954 her primary goal was strength, which I found to be totally AWESOME, as that’s not a PRIMARY goal held by women I coach (its usually weight loss/fat loss). Well, Anna has been without question achieving that goal, recently deadlifting 290 Lbs!!! WOWSA! Her Back Squat isn’t far behind and she Rx’s her weight on every workout! Anna has also been tackling her skills one at a time. She has mastered double-unders and is currently working on fine-tuning her T2B’s. 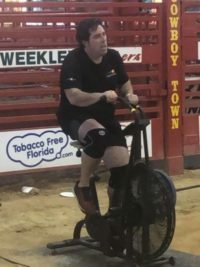 When Anna started CrossFit 954 she was a ‘texbook’ beginner, but she has quickly moved up to the ranks of an intermediate athlete, and I am guessing that within another 6 months, she will be in the top 3 of the leader board consistently. Anna also just completed her First CrossFit Games Open season and she participated in our 30-Day Bounce Back Challenge back in November losing 11 pounds! 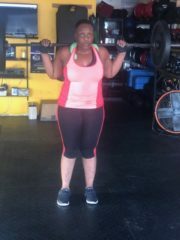 Anna has lost 25 pounds (I’m guestimating but at least this, could be more) since joining CrossFit 954! What I admire most about Delevoe is that no challenge is too big and she’s OK with being uncomfortable. She’s always down to push herself to the limits. She is extremely coachable, she rarely complains and as most success stories, she SHOWS UP CONSISTENTLY!! Delevoe, I’m so glad we crossed paths a few years ago at Office Max (Lol) and even more so I admire your worth ethic, your discipline and your willingness to always give your 100%. You’re a true champion and I look forward to your continued success!